Want to Take Guitar Lessons in Wolverhampton? Looking for guitar lessons in Wolverhampton? Great choice! The guitar is a well-known instrument that plays a big role in many musical settings. Its versatility makes it part of many genres where it works both in the rhythm section and as a solo instrument. Classical guitarists exploit this versatility especially well - we hear both melody and harmonic accompaniment at the same time. Take guitar lessons in Wolverhampton with one of our expert guitar teachers, and get 50% off the first of your guitar lessons in Wolverhampton. High-Quality Guitar Lessons in Wolverhampton Really Make a Difference! This is especially true for beginners. When you start guitar lessons in Bristol, having the basics of a solid technique (explained in a fun and engaging way) will save hours and hours of frustration later down the line. All of our guitar teachers have trained to a professional standard and are performing or recording musicians in their own right. However, this isn’t enough to make great guitar lessons. We can guarantee that your guitar lessons in Bristol will be taught by guitar teachers who have honed their ability to communicate technical and music theory ideas, concepts and exercises in clear, simple, language. These skills, coupled with great enthusiasm and the determination to personalise the learning experience for each student means that MusicTutors offers some of the best guitar lessons in Wolverhampton. Try it out for yourself! Get in touch with one of our amazing guitar teachers for guitar lessons in Wolverhampton today and we’ll send you a voucher for a 50% off the first of your guitar lessons in Wolverhampton. Are you thinking of taking guitar lessons in Wolverhampton? Are you on the verge of buying your own guitar? It's important to find a guitar that you love and feel comfortable with. You can try out different types and manufacturers in your local music shop, and it's always worth asking your one of our guitar teachers what they recommend before buying! Here are some tips from us on what to take into consideration before making your final decision. But remember, the most important thing is that you choose something you're comfortable playing in your guitar lessons in Wolverhampton and in your practice. The classical guitar is often recommended before the acoustic as a beginner instrument for your first guitar lessons. It's thought to be easier to play as it has nylon strings and a wider fretboard, making chords easier to play. As mentioned before, classical and acoustic guitars are quite different. 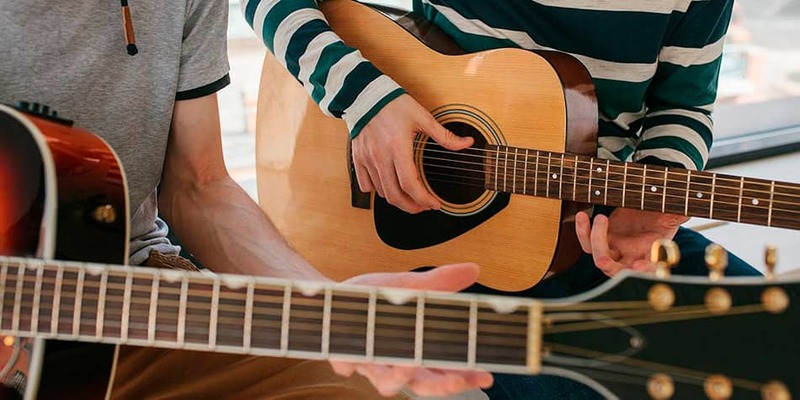 As a beginner, there are two significant differences to take into consideration before choosing this for your guitar lessons in Wolverhampton. The classical guitar has a wider fretboard which can make learning chords a little easier, as there's plenty of room for all your fingers and you can easily see what finger goes where. It also has nylon strings which are much softer than steel strings. This means your fingers are less likely to get sore on your first go! Another advantage to starting on a classical guitar is the nylon strings can make it easier to get a great clean sound sooner. One disadvantage though is while the wide fretboard can be a great help, it can also be a hindrance - if you have small hands, it might be hard to reach more difficult chords. Of course, classical guitar is perfect if you're wanting to learn to play classical pieces - hence the name! But if you were working towards pop/rock pieces, it would be worth considering moving on to an acoustic or electric guitar if you're using a classical guitar, to begin with. There's no need to amplify a classical guitar, though you can purchase classical guitars with built-in pickups if needed. Without pick-ups, classical guitars are perfect for small settings like singing songs around a campfire, in the living room or in small venues. The acoustic guitar is equipped with steel strings, which can make it harder on your fingers at first. However, this will pass over time, the more guitar lessons you have. The skin on your fingers will harden and then you won't feel anything! It's a great idea to start building the strength in your fingers from your first guitar lessons in Wolverhampton, which makes the acoustic guitar a good beginner instrument in that respect. Another advantage of an acoustic guitar is that it has a smaller fretboard which can make it easier to reach difficult chords if you have smaller hands. Your guitar teacher will advise on this in your guitar lessons in Wolverhampton. The electric guitar is equipped with metal strings, much like the acoustic. However, the strings are finer and the action is lower, making it much easier to play than the acoustic. 'Action' refers to the height of the strings from the fretboard - when it's lower, the strings are easier to press, and when it's higher, more difficult. The fretboard is also thinner, making navigation more manageable. You might find your guitar lessons progress a little quicker with the electric, in that respect. The electric guitar doesn't make much sound on its own - you will need to connect it to an amplifier to get the sound you want. It's also important to choose the right amplifier, so make sure to ask advice from your teacher on a good beginner amp. One of the advantages of the electric guitar is also the wide variety of sound you can achieve - there is almost an infinite array of effects pedals to choose from which can make your guitar sound completely different! You can even build a 'pedal board' with your favourite pedals on it so you can quickly switch sounds for different parts of a song. This is something you can learn about in your guitar lessons in Wolverhampton. There is often some fear around a child wishing to take guitar lessons in Wolverhampton with an electric guitar. It is important to remember that your child may have been inspired by listening to or watching their favourite band. This inspiration is gold dust as it provides a steady stream of motivation – even when the going gets tough! For some students, an acoustic or classical guitar simply won’t cut it. Modern production of amplifiers also means the sound can be controlled. Many beginner amps also come with headphone jacks, enabling near-silent practice! Pedals, effects pedals and all manner of potential accessories are also a draw for the electric guitar. It's worth saving some room in your budget for some accessories a little way down the line to keep interested levels high! This is in contrast to the simplicity of a well-made classical or acoustic guitar. If a classical/acoustic guitar is the instrument of choice, set the best budget you can and use it on an instrument of quality. Well-made instruments by well-known brands will hold value, and selling second-hand will be an option should things not work out as planned. Similarly, when searching for an instrument within your price range, the second-hand market (with the help of an expert) is an option worth exploring. Ask your guitar teacher in your guitar lessons in Wolverhampton for advice.